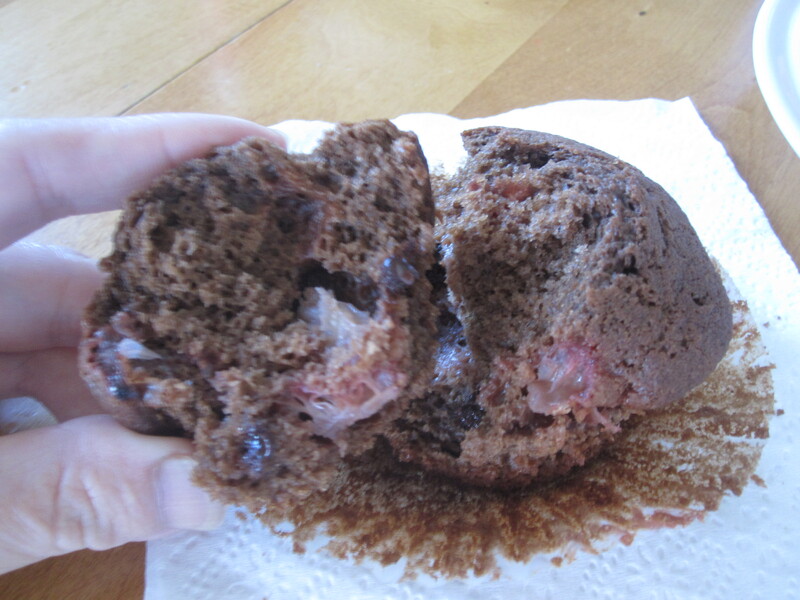 Okay, last time I made strawberry chocolate muffins, I used 3/4 cup milk for 10 muffins– it was good, but a little too moist and too soft to hold its shape. The batter was kinda runny because I used milk, which contains more water. This time I fine tuned the recipe around– changed the ingredient proportion for 12 muffins, used whipping cream (which is thicker than milk), and switched to egg separation method. I believe the egg separation method is the main key to fluffy muffins. It’s the same principle as making a chiffon cake, and the outcome is really fluffy baked goods. Yes, it requires more work, but not too bad in this case. Give it a try! Preheat oven to 400°F. Line muffin pans with muffin cup liners. In a large bowl, sift flour, 4 tbsp sugar, baking power and salt. Make a well in the center. Whisk all ingredients in egg yolk mixture to blend well. Add in melted butter and mix well again. Pour into flour mixture. Use a spatula to fold in just enough to moist. The batter will be very lumpy and thick like wet dough. Do not over mix the batter. In a separate clean bowl, whip egg whites on high speed until it looks white and bubbles are very tiny. Gradually add in sugar. Continue whipping on high speed until soft peak (curve tip) forms. Fold in whipped egg whites into the batter in 2 batches, until all whipped egg whites just blend well. The batter at this point will still be lumpy but a little loose. Add in strawberries and chocolate chips, fold in a few more times. Spoon batter into muffin cups. Bake for 20-22 minutes and the muffin top springs back when lightly pressed. Remove to cool on a rack for 5 minutes before serving. Eggs: be sure to use room temperature eggs. A quick way is to soak eggs in luke warm water for 10-15 minutes to bring to room temperature. Whipping cream: I used whipping cream instead of milk because whipping cream is thicker, and thus the batter was not as runny compared to using same amount of milk. If you use milk (preferably whole milk), start with 2/3 cup first to get the batter moist enough (batter should be dense like scone batter). You can always add a little more if needed. You can also use whipping cream/milk combination or substitute milk for cream, but if milk is used then cut down amount of liquid (starts with 1/2 cup then gradually adding a little more as you fold in batter) because milk contains more water and better absorbed by flour mixture, and thus you don’t need as much amount as cream. If you have hot cocoa mix sitting in your pantry too long, you can use it too instead of unsweetened cocoa powder, but cut down sugar to 2 tbsp as there is sugar in hot cocoa mix. 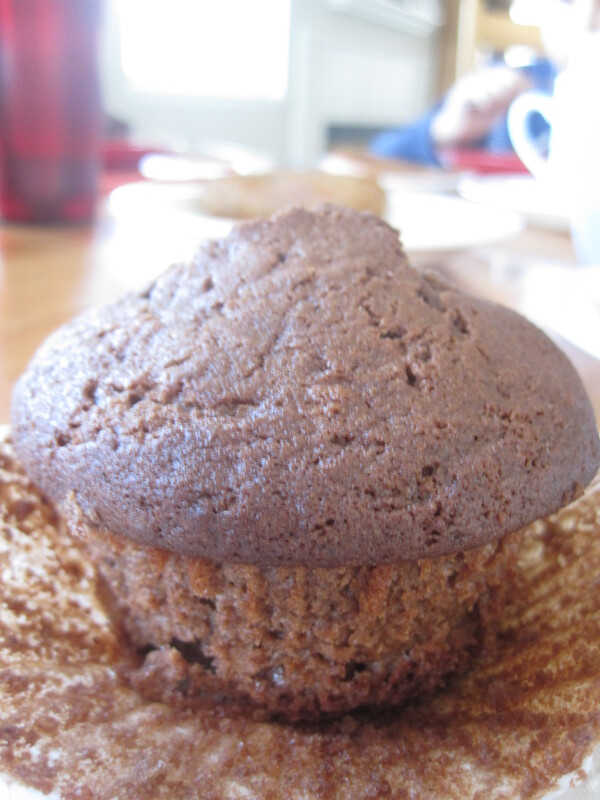 The chocolate flavor won’t be as strong but the muffins still taste good. Other tangy berries like raspberry and blackberry are also good choices for making these muffins.